The girl who dances with shadows. My senior year of high school began with the attack on the Twin Towers. Images of the flaming towers were fresh in all our minds that fall. This was an act of war, and even though I lived 3,000 miles away in Oregon, it still felt much too close to home. Who could do something like this? Is this the beginning of World War 3? I wondered. That year I was part of a group called the Young Women’s Theater Collective. We wrote and performed original shows. We decided to name our fall show “Dancing with Shadows.” It was a declaration that in spite of the darkness in life, we could still find joy. Our show included comedic sketches, dancing, singing, and more somber pieces dealing with issues like substance abuse and depression. We performed to sold-out shows at the WOW Hall, and yes, even shared a promotional poster with Slick Rick. My heart leapt into my throat in surprise. I had to have that carving. “How much?” I asked cautiously, fearing he might be eager to rip off an obroni. He quoted a reasonable price, so I paid him the few dollars and bought the carving. 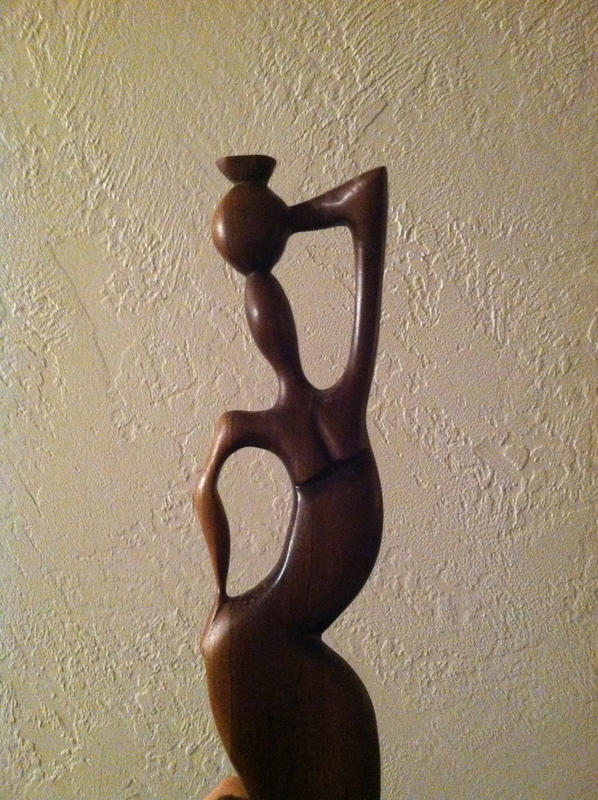 The girl who dances with shadows now sits atop my tall bookshelf in our living room. Was this an interesting coincidence, or was it a purposeful message from God to me? I can’t say for sure, but it’s a reminder to me that in spite of whatever may come — I will dance. Excellent entry! I loved that Young Women’s Theater Collective show.